UCLA patient Jonathan Koch recently underwent a surgery so rare—a hand transplant—that it has been performed fewer than three dozen times in the United States. 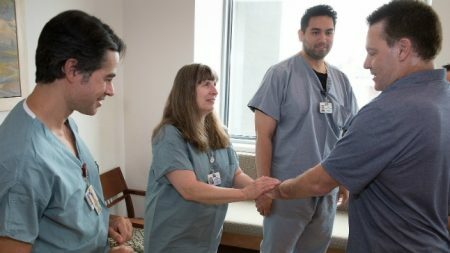 Over the months-long course of preparing for his hand amputation and transplant surgery, Koch worked closely with lead surgeon Dr. Kodi Azari, transplant physicians Dr. Sue McDiarmid, Dr. Gerald Lipshutz and Dr. Erik Lum, and transplant coordinator, Erin Core. But Koch, a Los Angeles entertainment industry executive, did not get a chance to know the much-larger team of professionals, some from outside UCLA, who were working behind the scenes training for the surgery. Still others were being tasked with finding the right donor for the transplant procedure or ensuring that all tests, procedures and compatibility assessments went smoothly. At a special reunion in June—eight months after the October 2016 procedure -- Koch met about 40 of the people who played key roles in his care, both before and after the surgery. For many of those in attendance it was the first time they had seen Koch since the operation or heard him speak about the experience. For Koch himself, it was a chance to see the bigger medical picture. “Dr. Azari’s been so clear about this being a team effort that to finally be able to put faces to that whole experience and see them all together was just overwhelming,” said Koch. Dr. Ronald Busuttil, executive chairman of the department of surgery at UCLA, said the success of the surgery and follow-up can be attributed to the entire group. He was also impressed by Koch’s remarkable progress. “Seeing how his hand is functional, how it’s got sensation, how he shakes his hand and how he’s moving it in a very precise manner, is remarkable and so wonderful,” said Busuttil. Of course, transplants can’t happen without the individuals and family members who agree to donate their organs and limbs to another person. One Legacy, the organ procurement organization that facilitated the hand donation, had been working with UCLA for five years to develop protocols for working with donor families. “It has been astounding for us to do something new like this and for donor families to say ‘wow,’ we can make a difference in someone’s life,” said Tom Mone, chief executive officer of One Legacy. But the team behind the surgery extended even further than One Legacy. One unusual aspect of Koch’s transplant procedure was the partnership between UCLA and other Southern California healthcare institutions, including Kaiser Permanente and the Keck School of Medicine of University of Southern California. To provide the best outcome for the patient, Azari recruited other orthopedic and hand surgeons to build a team of experts who seamlessly worked in concert during the intricate and lengthy procedure. Dr. Ali Ghiassi, an orthopedic surgeon from USC, added that the collaboration included using USC’s live tissue dissection lab to practice for the surgery. Ghiassi said the experience was personally transformative. Koch also met the team of seven operating room nurses who prepared for his transplant and cared for him during the 18-hour surgery. “It’s very humbling to know you can do a small part for someone and we’re glad we could bring everyone together to be a part of it,” said Kristine Alessandrini, the administrative nurse for plastic and reconstructive surgery and co-coordinator for the hand transplant nursing team. Rounding out the guests whose contributions were critical to transplant’s success were faculty and staff from pathology, radiology, psychiatry, transplant administration and the anatomy lab, where the surgeons practiced the transplant surgery. Azari introduced each person to Koch and explained their role in his surgery. For more information about Koch’s story, visit ABC 20/20 and Los Angeles magazine. 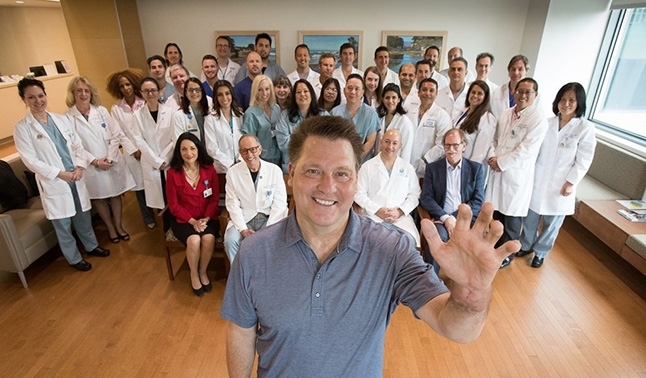 For more information on UCLA’s hand transplant program visit the UCLA Health Hand Transplant website.